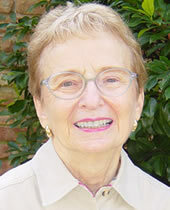 In 2004 at age 73, Pearl Meltzer made her musical theatre debut as an actress, singer and dancer in “70, Girls, 70,” at the Fine Arts Center in Uptown New Orleans. Singing and dancing onstage in front of a live audience was a new frontier for Pearl. After more than 40 years of helping out “behind the scenes” like running wardrobe and painting scenery, Pearl found her muse… and made the great leap to sing on the other side of the curtain. The side with an audience. Pearl’s trajectory toward the stage began quite innocently when she was asked to sing Happy Birthday to a friend in her play-reading group. As it turned out, her spirited rendition wowed everyone in the room – including the noted theatre director Stocker Fontelieu, who promptly asked her to join the cast of”70, Girls, 70.” And what a great decision that was. Audience response to Pearl’s performance indicates that this newly discovered singer and dancer can kick her heels with the best of them. Pearl Meltzer exemplifies the excitement and rewards that can be experienced when we are willing to leave our comfort zone – to stretch our boundaries and expand our experiences. Pearl’s extensive background in the medical sciences left her longing for greater involvement with the arts and humanities. Upon her retirement at age 65 she immersed herself in the arts. She now makes time for regular classes on a variety of subjects including psychology, literature and religion, even taking her education on the road. Pearl is active in the ElderHostel program and coordinates group participation for a number of their events. Although the performing arts have encouraged Pearl to step outside of her comfort zone, her fortitude to try new things came from within, nurtured by years of experience and the lessons of life. With risk comes reward, and Pearl will be the first to tell you that pushing the envelope makes life so much more fun. Pearl Meltzer is a vivacious woman, a real character and… a true Tenet Choices Champion.